When I was a kid (waaaaay back in the 1970 ‘s), one of the most popular toys around was the ant farm. This was a wild contraption, made of clear plastic. Inside was a mess of dirt, some plastic scenery, and a bunch of ants. The fun came in as you watched the ants burrow through the dirt, monitoring their interactions and behavior. It was one of those toys which, while we may not have realized it at the time, was both Educational and fun. Well, now one of my favorite developers, Concrete Software, is bringing this experience and a whole lot more directly to your iPhone and iPod Touch with the fantastic simulation game, Ant Hill. 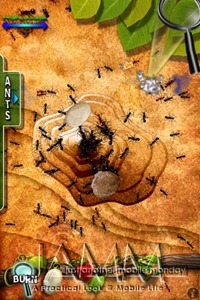 I never had an ant hill as a kid, but I remember them looking very interesting, as does this new game. Check out Doug ‘s Intro to it HERE. Just a quick note that the new Ant Hill went live today which now includes Ant Mines! Sounds fun – thanks for the info. The name of the app has been changed to Pocket Ants! Since the last post there have been a ton of new features such as the Ant Magnet, Flamethrower, Freeze Ray, Laser, etc.